The ESL Summer Camp at Pickering College is specially designed for international students aged 12-18 who are motivated to advance their English language skills and to experience an overseas summer boarding vacation. The camp is well balanced between classroom instructions and outdoor activities which provides opportunities for leadership and personal development. Pickering College was founded as the West Lake Seminary by Quakers in 1842 and, as you might expect, has had a long and interesting history since. It began—remarkably for the time—as a co-ed school, and as such provided an expression of the Quaker ideal that both sexes should be educated equally. In that, and so many other ways, Pickering has truly charted its own course, though always with an eye to the international community. The campus is frankly gorgeous, with the full range of amenities, including extensive athletic facilities. It’s also ideally located to be able to offer a true camp experience—campfires and s’mores—as well as trips to some of Canada’s foremost cultural and historic landmarks. (The campus itself has some nice landmarks of its own, including paintings by Franics Johnston, a member of the Group of Seven, who also taught here. Rogers House, the main building on campus, was designed by John Lyle, who was also the architect for Toronto’s Union Station.) The ESL programs build off the expertise of the faculty. They are run all year, though the summer programs are dedicated to language learning while offering a fun, vibrant, collegial experience. Campers gain a sense of the school, as well as a sense of the country—for some, the summer programs serve as a means of experiencing the school with an eye to enrolling in the boarding program. Certainly, it can be a great entrée, allowing for an easier acclimation come September. For others, it's a unique opportunity to gain langauge skills from qualified, experienced instructors. First of all, I would like to express my sincere gratitude and appreciation to all teachers, counsellors and the camp directors. Both Bosco and Antony are definitely having a great time in Pickering College. They have both already expressed that they would like to return/study next September. Thank you for your invitation to the graduation ceremony, it is a pity that I will not be in Toronto then. However, I will be contacting you soon about their performance and questions about their application. Thanks very much. I am very pleased to receive your weekly update email. I am very happy when my son tells us of the many excellent daily activities which he has experienced during the course of the ESL program. I would like to express my sincere thanks to all of you for the wonderful memories that you have given to my son. Thank yo so much and wishing you all the best! Thank you all for your service to my son. He enjoyed himself and talks a lot about his experiences at Pickering College. We wish all the best to the staff of Pickering College. Thank you for much for the weekly photo updates. I love them! I think Jonathan is experiencing a wonderful summer camp! What I liked about the ESL classes was that it was not just about taking notes and sitting down. It involved a lot of debating and discussing and through this we could improve our English skills. The counselors are very friendly and always takes care of us. The camp is really well organized and fun! During my time at Pickering College, I really enjoyed speaking my friends about our different cultures and countries. I was able to make a comparison with my country and gain more awareness of the world. I would say that Pickering College compounds is like being in an American movie and I loved my time here. What I enjoyed about the ESL classes was that the teachers gave us fun projects such as preparing to host a radio show and presenting an environmental problem as I like to discuss and find solutions with my friends. I also liked Pickering College's facilities of having the track, the arena and three large yards. What I enjoyed most about the camp was the diversity I experienced. I had never before met people from so many other countries. I really enjoyed learning about other cultures and getting to know the other students' countries. During my time at Pickering College, I had a great experience. We did all sort of activities, the classes were really educational and fun, I never got bored, there was always something to do. The camp gave me a good idea on how beautiful Canada is. I enjoyed my time at Pickering College because I could have fun and improve my English at the same time, with interesting classes, awesome trips and making friends. It was an unique experience in a life time and I am sure I will never forget the time I had at Pickering College. My experience was pretty great, we had a lot of activities and trips that were so fun and interesting, I know a lot of things about Canada now and that’s amazing. I will recommend this camp to my friends because it worth’s every single moment, here the people are super nice. I won’t forget this experience because it helps me growing as a student but also as a being woman, which is really important for me. I really enjoyed this summer camp because I made many friends from different countries. I liked the teachers because when I had a question about something, they taught me. If you come to this camp, you can do many new things. There is a radio station at Pickering College and we did shows on the air. In class I learned many things. This is my experience of this camp. This camp was so much fun. I enjoyed Pickering College very much and I have improved my English in 4 weeks. I learned more than English. I would like people in other countries to know that if English is not your first language, I would like you to come to learn at Pickering College. It was very good for me. 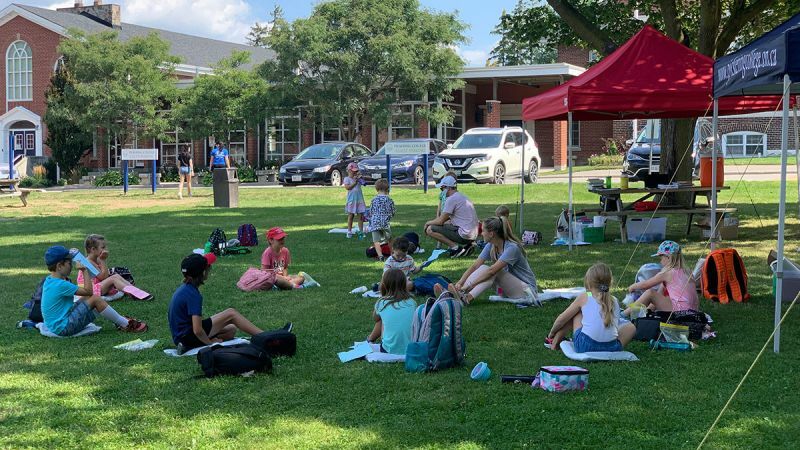 Pickering College would like to welcome you to our rewarding and exciting ESL Summer camp program held on the beautiful grounds of one Canada's oldest independent school. Our mission with the ESL camp is to provide our students with the type of mentoring that will foster intellectual and personal growth, social awareness through interactions with global students and leadership skills. Pickering College offers experiences you won’t find anywhere else. We welcome you to discover the difference we make in our campers lives! My two years at Pickering College ESL Camp have been absolutely amazing! The staff here are wonderful and they truly care about the students. My favorite thing about the programme is that students do not only get the opportunity to improve their skills in English but also get the chance to explore Canada. Students create relationships with people from all around the world, that they cherish for years to come! My experience with the Pickering College English as a Second Language Program has been nothing but astounding. Working as an English as a Second Language teacher this past summer provided me with the opportunity to work with students from around the world at a close and personal level. With no more than sixteen students in each class, the English as a Second Language teachers feel that they are able to work one-on-one with students to improve all aspects of their English reading, writing, speaking and listening skills. I can say that I am proud of every one of my summer students. The program is inquiry based with an emphasis on collaboration and group learning. With a focus this summer on the European Cup and the summer Olympics, we were able to involve sports from around the world to engage our students with real life practices in the classroom. I have seen students grow in both their social and academic abilities and have never met a more amazing group of inspirational, international students. I am writing a few words to thank for the wonderful time that my daughter had at Pickering College this summer 2017; it was a great experience for her, she was so happy, she learned, shared, cried, ate and specially she made many new friends from all over the world. As parents we made the best decision in sending her to Pickering College! I want to thank everyone at Pickering College who made this camp the best experience for my daughter ever. Pickering College is one of a few private boarding school in Canada that offers excellent ESL + Activities programs during summer. It also provides very welcoming and at-home atmosphere from the first day students arrive at campus until the very end when students walk through the security gates at Toronto Airport. Every summer program staff at Pickering College is well trained, experienced, and most importantly, wanting to make the summer program memorable for students in every possible way. Therefore, all of our students are always well taken care and have lots of fun. There are great ranges of activities, the fun part of summer program, such as camping and outdoor activities in nature, city sightseeing of Toronto, watching professional games, and many more. In addition, students come from many different countries to the program every summer. The administration works its utmost to have as many nationalities and mixes as possible. This creates an atmosphere where students are encouraged to interact with students from different cultures and backgrounds in English. We would say this summer program is the perfect program for those who want to improve English and experience what it is like to go to a boarding school in Canada. I think the ESL camp was the best thing I ever did in my summer holidays. It also was a great thing to meet other people from other countries. I met guys from Mexico, Colombia , Hong Kong… and they taught me about their culture, it was very funny. I had a very great time in my summer at Pickering College and I really want to come back ! Best wishes. Last summer I spent a fabulous time in Canada. It's a great experience where you have fun and at the same time you can learn English and about other cultures. The staff was so nice! We have classes in the morning, and in the afternoons I cooked, I made a short film, I played sports, I went to swimming pools, with slides and more fun things! In the evenings we watched films and spent time with our friends eating marshmallows and having barbecues. I’d recommend this experience to everyone who wants to meet people from all around the world. 2019 ESL SUMMER CAMP REGISTRATION IS NOW OPEN! Interested in ESL Summer Camp at Pickering College?